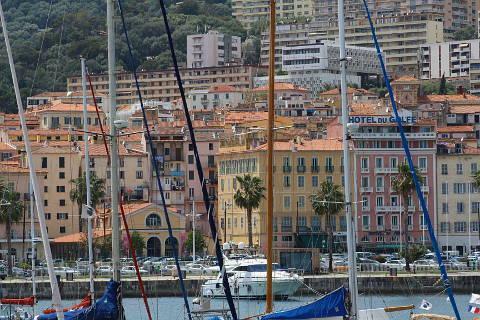 On the west coast of Corsica, Ajaccio (population about 50,000) is the capital of corsica. The town has wood covered mountains circling it to the rear, and the port and citadelle towards the sea, on the Gulf of Ajaccio. 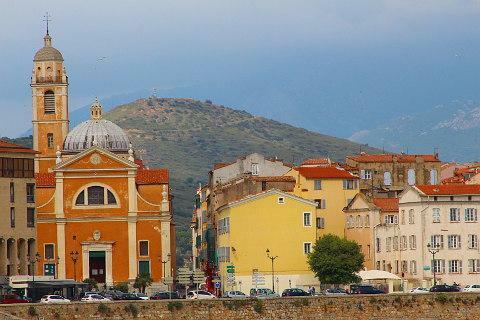 This combination means that the climate in Ajaccio remains mild even during the winter months - hence the town is popular with tourists for much of the year around. Ajaccio has its origins in a Roman town that was located on the hill just to the north of the present town, and numerous ruins and artefacts have been uncovered from this earlier occupation. 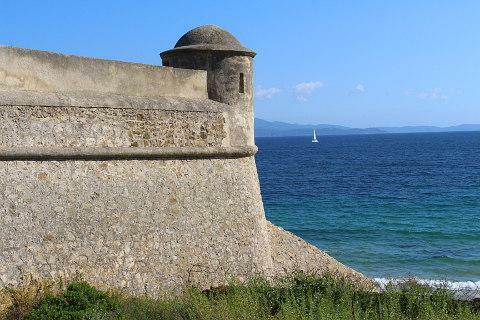 Ajaccio's more recent claim to fame is as the birthplace of Napoleon Bonaparte. This will not escape your attention on a visit to the town, as you pass the house where he was born - now the National Bonaparte Museum; the caves where he played; and statues of Napoleon and streets and places named in his honour. Perhaps the most impressive monument is the one in the Jardins de Casone. The centre of Ajaccio is based around the 16th century citadel (still in military use, so not open to the public), and spreads west and north of the citadel into the town. 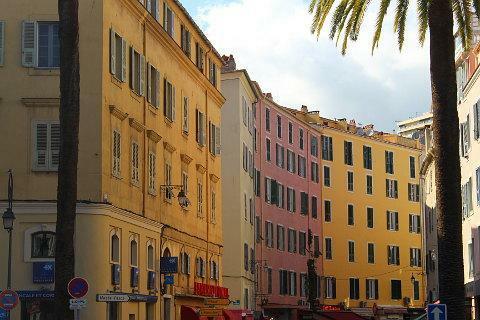 This 'old town' part of Ajaccio includes the Place Bonaparte, the cathedral, Rue Cardinal Fesch and continues up to and around Place Marechal Foch near the seafront, and is the part that is of most interest to visitors. Exploring the old town you will find picturesque pastel painted houses along narrow streets, and an extensive choice of cafes and shops, many of the upmarket variety. The 16th century baroque style is quite modest for a town of this size. The most notable highlight inside the cathedral is a painting called 'The triumph of Religion' by Delacroix. Note that it was in Ajaccio cathedral, the Cathedrale Notre Dame de la Assomption, that Bonaparte was baptised (you can still see the marble font where it happened). 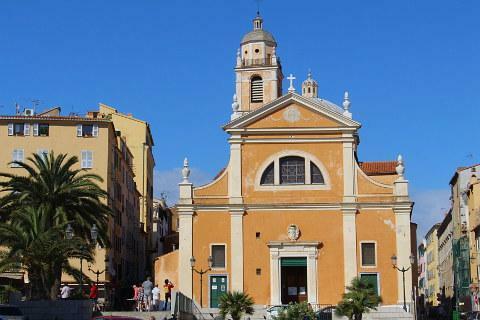 Another religious monument of note in Ajaccio is the Church of Saint-Rock (on Cours Napoleon), built in the 19th century in a neoclassical style. Place Foch especially is a very popular place to sit under the shady trees in the square and do some people-watching. 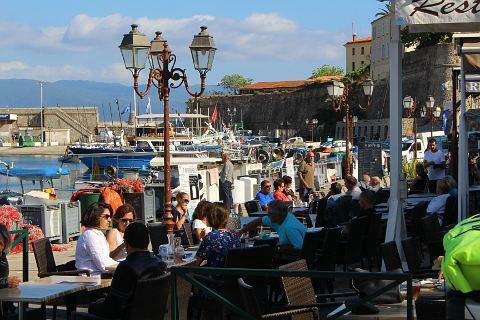 As with most Corsican sea-facing towns the harbour in Ajaccio is also a popular place for a promenade, lined with palm trees and a good choice of cafes. Further along you get to the port where the Corsica ferries come in as well as some private yachts that look nearly as large! The old town, around Place Marechal Foch, has narrow streets lined with attractive, typically Mediterranean, houses and is very picturesque. It is also here that you can see (and visit if you are so inclined) Napoleons birthplace. 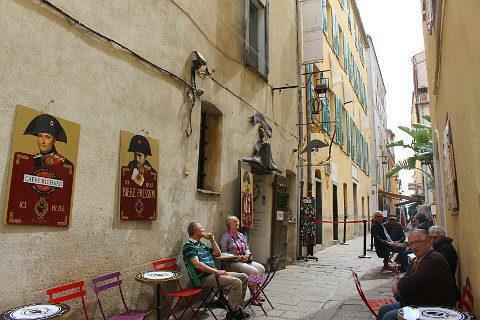 There are a large number of cafes, bars and restaurants around Ajaccio, and it is in these that you will find the true town - the laid-back casual approach to life that Ajaccio seems to adopt so well. 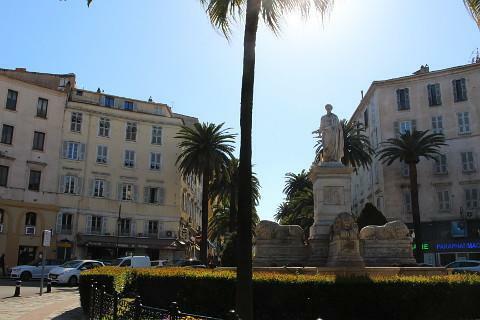 The rest of central Ajaccio merits an explore as well, to see the grand prefecture (local government office) in the 19th century Palais Lantivy, the Quartier des Etrangers ('foreigners quarter') and the 19th century town hall. There is also a high quality beach along the coast in Ajaccio. If you follow the seafront promenade you will find other, usually quieter, beaches further along. Along the seafront are also children's parks, petanque areas, skate parks and outdoor gym equipment. 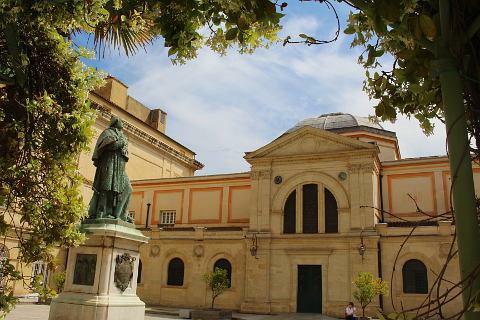 Located 200 metres north of Place Foch, the Fesch Museum has a highly regarded collection of Italian Renaissance paintings, originally collected by Napoleon's uncle. The region outside the town has several highly rated beaches, including those to the south-west of the town around Capo di Muru. A popular boat trip that starts from Ajaccio is to visit the Isles Sanguinaires (best seen at sunset). There are also some nice walks from here to the Capo beaches. Another site not to be missed is the prehistoric site at Filitosa, 40 kilometres south of Ajaccio. Ajaccio is an important arrival point for visitors to Corsica with regular ferries operating between here and Marseille, Nice and Toulon on mainland France. There is also an airport with flights to several airports in France (eg Paris, Marseille and Nice and other European destinations). 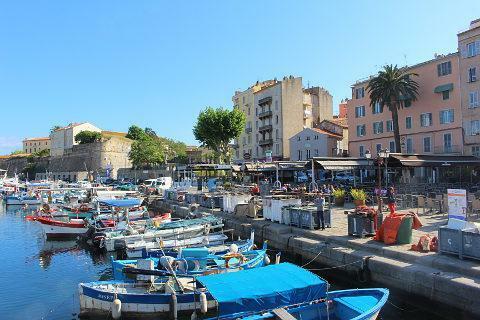 In the port, especially in summer, you will see the third option - Ajaccio is a regular stopping point for cruises around this part of the Mediterranean.